*Labor is slow and hard or stops completely. *The baby shows signs of distress, such as a very fast or slow heart rate. 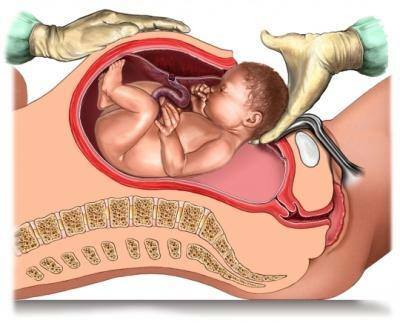 *A problem with the placenta or umbilical cord puts the baby at risk. *The baby is too big to be delivered vaginally. *The baby is not in a head-down position close to your due date. *You have a problem such as heart disease that could be made worse by the stress of labor. *You have an infection that you could pass to the baby during a vaginal birth. *You are carrying more than one baby (multiple pregnancy). *You had a C-section before, and you have the same problems this time or your doctor thinks labor might cause your scar to tear (uterine rupture). In the past 40 years, the rate of cesarean deliveries has jumped from about 1 out of 20 births to about 1 out of 3 births.1 This trend has caused experts to worry that C-section is being done more often than it is needed. Because of the risks, experts feel that C-section should only be done for medical reasons. »What are the risks of C-section? *Infection of the incision or the uterus. *Blood clots in the mother’s legs or lungs. *Injury to the mother or baby. *Problems from the anesthesia, such as nausea, vomiting, and severe headache. *Breathing problems in the baby if it was delivered before its due date. *If she gets pregnant again, a woman with a C-section scar has a small risk of the scar tearing open during labor (uterine rupture). She also has a slightly higher risk of a problem with the placenta, such as placenta previa. »How is a C-section done? Before a C-section, a needle called an IV is put in one of the mother’s veins to give fluids and medicine (if needed) during the surgery. She will then get medicine (either epidural or spinal anesthesia) to numb her belly and legs. Fast-acting general anesthesia, which makes the mother sleep during the surgery, is only used in an emergency. After the anesthesia is working, the doctor makes the incision. Usually it is made low across the belly, just above the pubic hair line. This may be called a “bikini cut.” Sometimes the incision is made from the navel down to the pubic area. After lifting the baby out, the doctor removes the placenta and closes the incision with stitches. *You will need to take it easy while the incision heals. Avoid heavy lifting, intense exercise, and sit-ups. Ask family members or friends for help with housework, cooking, and shopping. *You will have pain in your lower belly and may need pain medicine for 1 to 2 weeks.